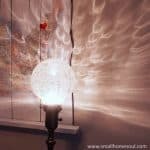 Antique Fair Deals, Finds, and Bargains - Girl, Just DIY! Last weekend my husband took me to an Antique Fair across the water from our house. 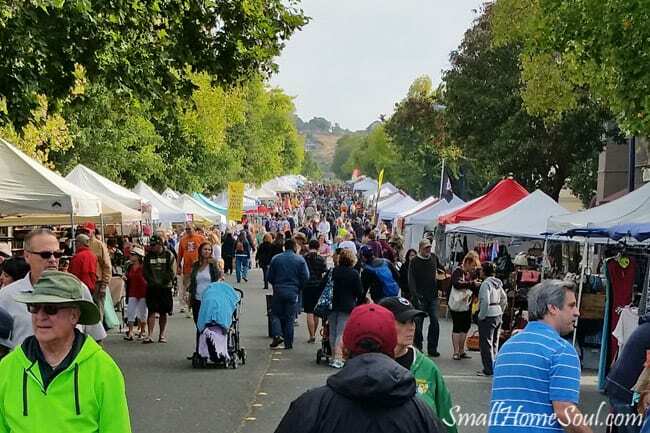 The Benicia Peddler’s Fair is held in the historic town of Benicia which served briefly as the California State Capital in the 1850s. The Peddler’s Fair started in 1963 as a small antique fair with vendors raising money for a local church. Today it runs nearly the full length of First Street. I took this picture at roughly center. The booths extended over the crest in the road and in the other direction toward the water. 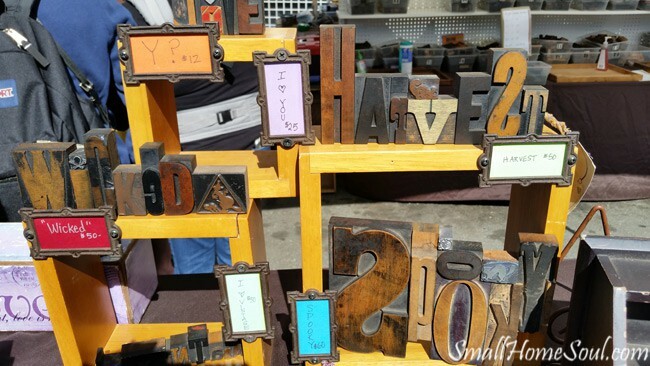 Over the years it’s grown, like many antique fairs, to include homemade crafts and the ever-popular food vendors. Corn Dogs at 9:00 am? Sure, and lots of people were doing just that. I was tempted but made us a big breakfast before we left home. We needed plenty of energy and it kept me from being tempted by all the goodies. The first thing I bought as we made our way through the crowds was a 2 lb jar of local honey from Glory Jeanne Honey. I forgot to take a picture of the table full of yummy goodness but I after my taste tests I chose a mild version called Heavenly Sage. Raw honey is so good for you, and local honey is great if you have allergies. As we moved along there was no lack of old stuff that reminded me of my grandma. Like these bowls (I think my mom has her old set). Some of the prices were pretty reasonable for an antique fair. The two sets on the left had good prices but the ones on the right, just wow…..$165!!! Maybe they’re a bargain to some collector. 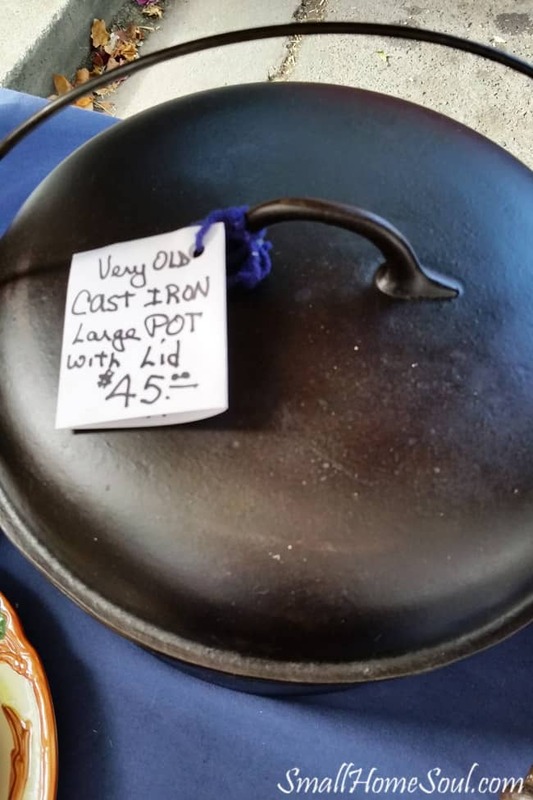 I have a small collection of cast iron so I was tempted to buy this beautiful old pot. It was in great condition and was a bargain. But it was seriously heavy and my cupboards are already overflowing so I resisted the temptation. There was no shortage of cast iron skillets either. I’m not a collector just for the sake of collecting so the pans I have I use. Some of these were cheap but most were authentic and pretty reasonably priced. In my opinion the older pans are so much better than ones made today. The bonus to buying old is they’re already seasoned and the older pans are polished. 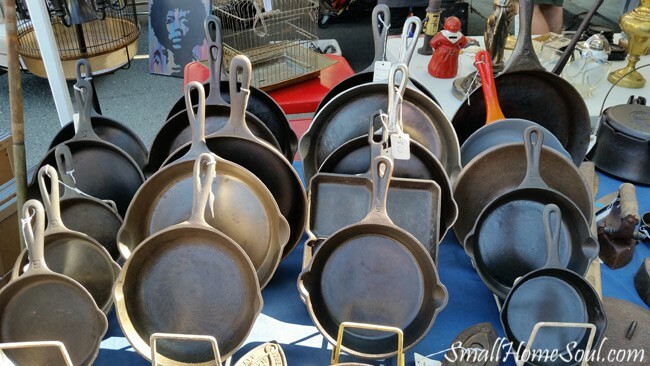 The best non-stick surfaces are on the old cast iron which means easy cleanup. It’s all about less work right? 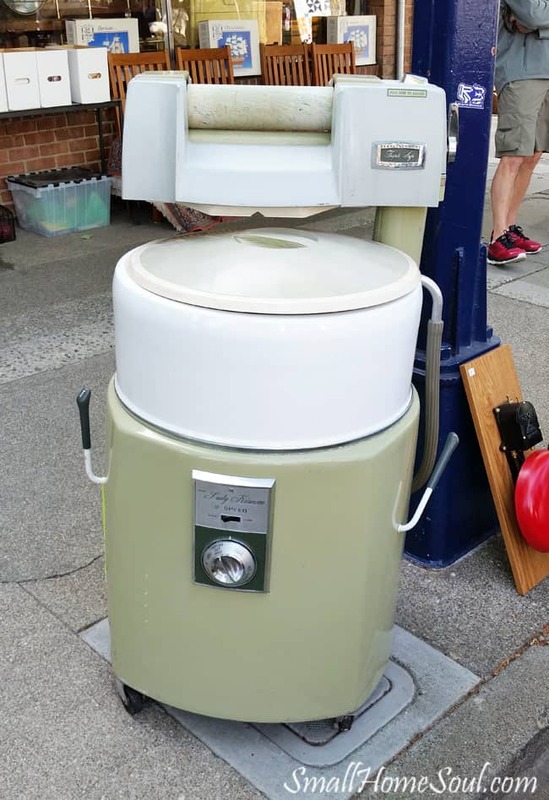 No more washboards and hand wringing clothes when someone finally invented the washing machine like this old Lady Kenmore. Thank you to whoever invented the washing machine!! Can I get an Amen? Compared to my grandma, and maybe even my mom, I’m spoiled and I know it. Sorry, not sorry! 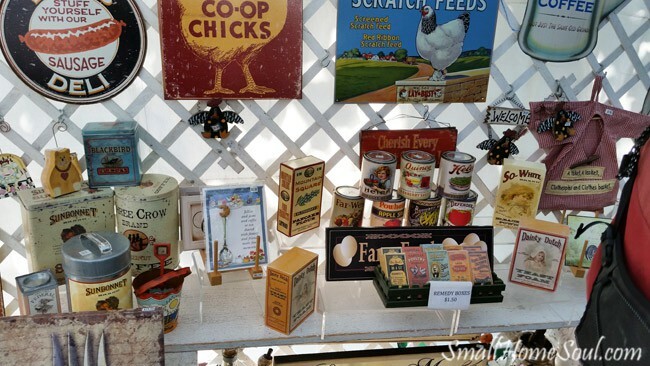 A little further down the way I ran across this great display of food packaging’s past. It’s so cool to see all the old pictures and illustrations on the labels. My grandma had some old spice cans and tins that were cool like some of these. I especially love the metal advertising signs with the chickens! 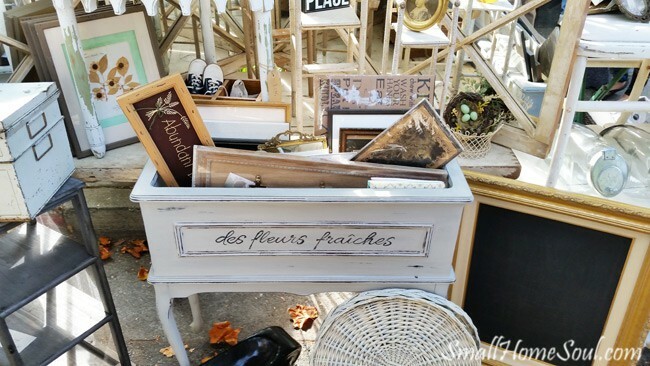 A visit to an Antique Fair today wouldn’t be complete without distressed furniture, market signs and re-purposed farmhouse frames. 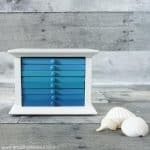 There were plenty of vendors just like this one, some prices were reasonable while others made me think “I can make that, and cheaper!” Haha, of course I’m going to say that because I love to DIY, and save money! 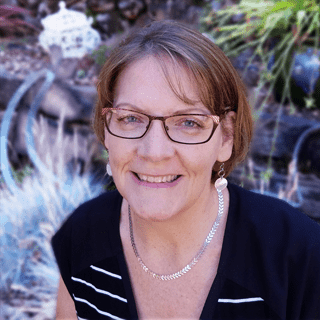 Antique Fair – my jackpot! I saw a lot of very cool stuff but my absolute most favorite booth at the Antique Fair came at the end of the day. The Village Goose and her Custom Letterpress Creations are so cool and unique. She buys old, very cool typesetter letters from all over the country. 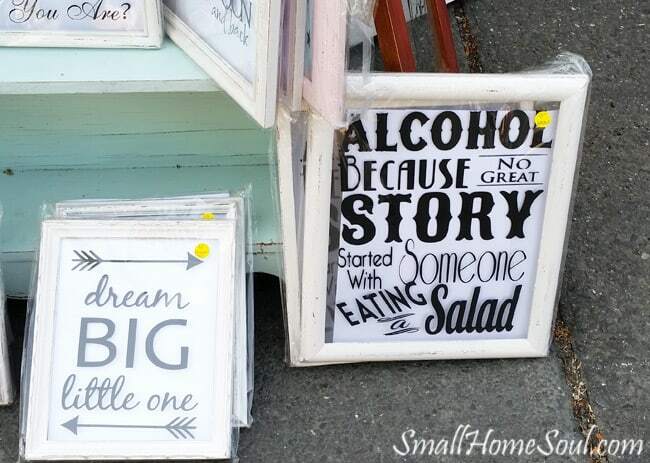 She started buying them to create gifts, like the ready-to-display signs below. And, she has a whole DIY section to create your own. At the back of this picture you can see multiple tubs of each letter. Each tub holds different sizes and fonts to mix and match until your design is perfect. Since I’m a big DIYer spending money on some of the stuff at the antique fair didn’t make sense. But this was different, my husband and I spent a while playing around with letters to spell our last name. 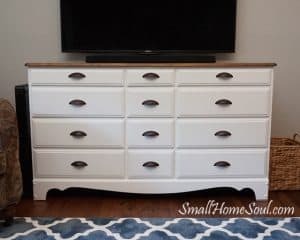 They aren’t cheap but the splurge is worth it because when I’m done putting it together I’ll have something very unique. Watch for that project in an upcoming post, I’m still thinking on the best way to display them. Hopefully I can find or make a cool board like the one I used for my DIY Map Art Project. 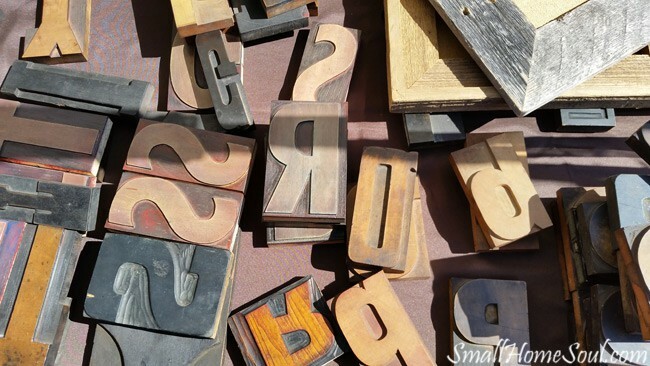 [UPDATED] Check out how my Vintage Letterpress Blocks turned out. I think you’re going to love it! 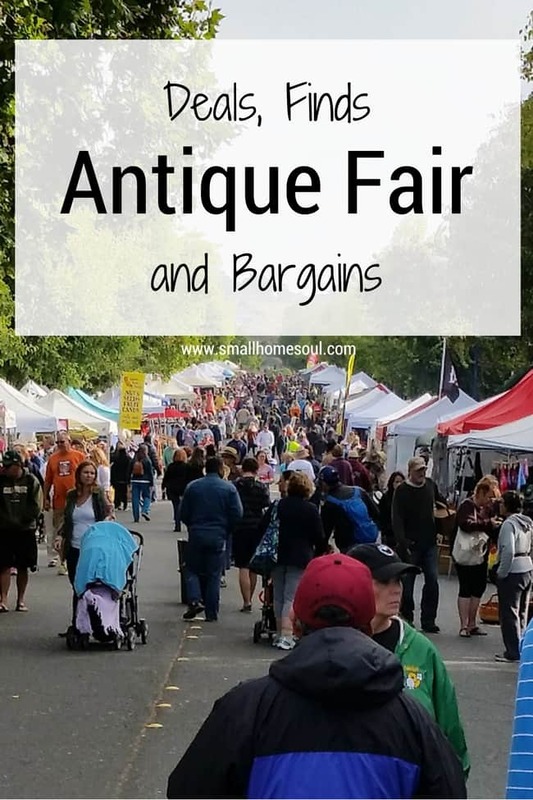 Going to an antique fair is a great way to support local artists and business people. 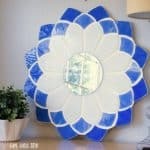 You can find some very unique items made by very talented people. Christmas is always coming and we all have a continuous loop of birthdays to buy for. 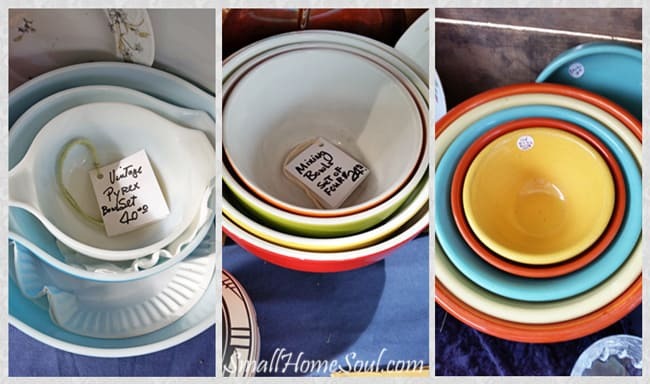 Do you have a favorite Antique Fair in your area? I’m sure this isn’t the biggest but it’s one of the local favorites. That’s all I have to share with you awesome people today, I hope you enjoyed seeing a little of what I saw at the antique fair. Haha!! I love the salad sign, that is ridiculous!! You have a great guy, taking you to shop for the day. My guy was never into that kind of stuff either, but he comes along with me and lately, I think he’s more excited to poke around than I am! Looks like a great day with some really neat treasures! Haha Kim, that sign is the best, I thought about it the other night when I saw the news report about our stupid swimmers who got into trouble in Rio after they’d eaten a salad (bahahaha 🙂 ). What a great flea market….I would be in heaven strolling along that street. I can’t wait to see what you do with those letters. Denise, I know how much you like to antique/junk shop, you would love it! WOW this sounds so amazing!!! If I ever get over to your neck of the woods I am sure taking a visit! Love those letters to bits!!! what a fun post, and totally my idea of Heaven!!! I also loved your favorite sign!! haha, so true!